Jatiya Sangsad (JS) Speaker Dr Shirin Sharmin Chaudhury on Wednesday said women empowerment is now visible in all sector in Bangladesh because of the steps taken under the leadership of Prime Minister Sheikh Hasina. “Sheikh Hasina has paved the way for women to get elected at the grassroots level through direct voting creating favorable environment for women empowerment,” she said when Indian High Commissioner Riva Ganguly Das called on her at the parliament office, said an official release. 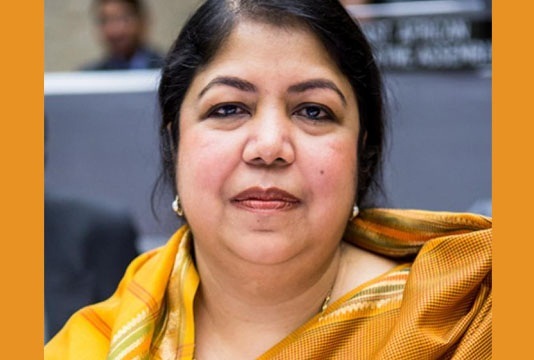 Noting that Bangladesh is now a role model of development in the world, Shirin Sharmin said under the leadership of Prime Minister, the country has got recognition for graduating to a developing country from the Least Developed Countries (LDCs). Development has taken place not only in the cities, but also in the rural areas due to the economic dynamism, she added. Terming Bangladesh as India’s one of important friendly countries, Ganguly said cooperation will continue between the two neighboring nations over the issues of mutual interests. Enhancement of regional communication will bring economic prosperity in all countries in this region, she added. She congratulated Shirin Sharmin for being elected as JS Speaker for the third consecutive term.